Stainless Steel Hanger Bolts and Screws. Click image to enlarge. 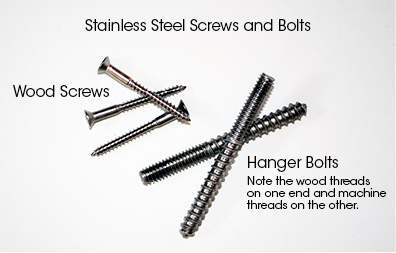 Stainless steel hanger bolts and screws – Do not use any other type of screw. Stainless steel is inert and does not contain carbon that will harm the tree. The length of the screws depends on the type of tree. Trees with thick bark will require a longer screw. Fixture – Make sure you use a fixture that is intended for down lighting. Most fixtures are designed for up lighting. If you do not use a fixture intended for down lighting water will get in the fixture and it will fail prematurely. Also make sure your fixture has a glare guard so you can set it to aim the light where you want it and avoid glare. Up-light Installer on ladder. Click image to enlarge. Make sure you have a firm foundation for your ladder. 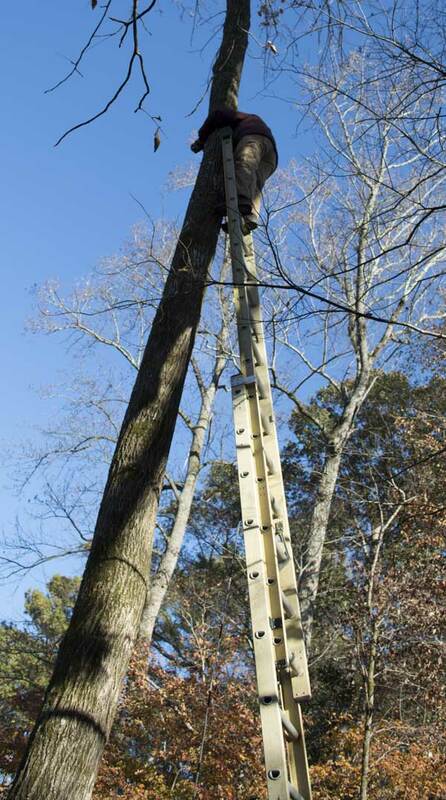 Make sure the ladder is safely positioned on the tree. 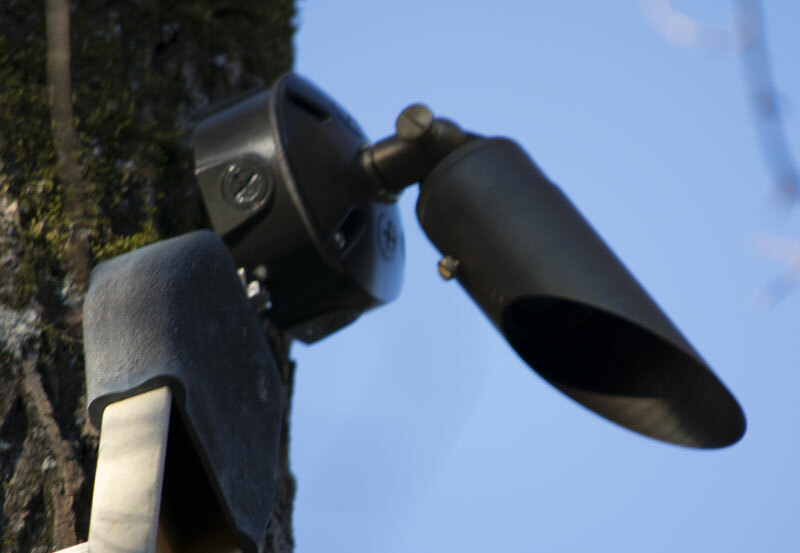 Use the stainless steel hanger bolts to attach the junction box to the tree. The key is to keep the junction box away from the tree so the tree will have room to grow (and not grow around the box). Once you have the box secure screw the fixture into the junction box cover and screw the junction box cover onto the junction box. 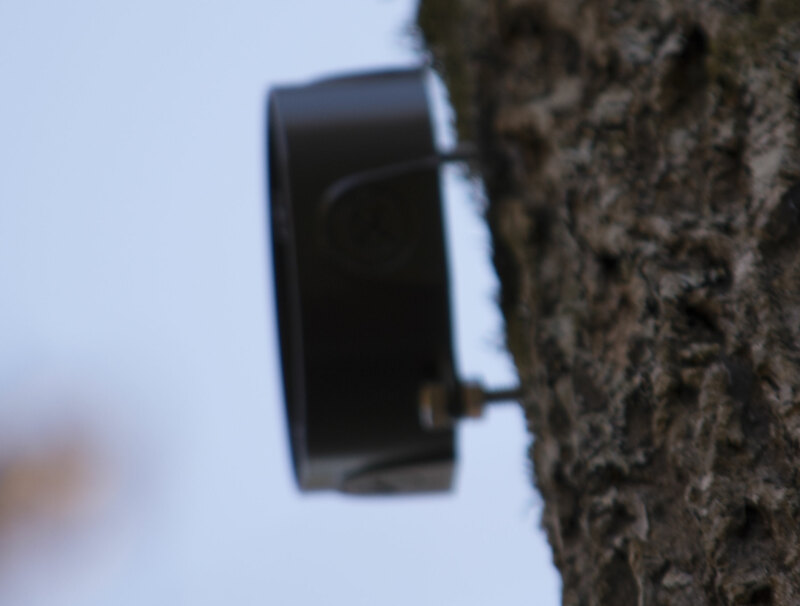 Mounting the junction box away from the tree will allow for growth. Click image to enlarge. Finally, screw your fixture into the junction box cover. Be sure your screw threads match up. 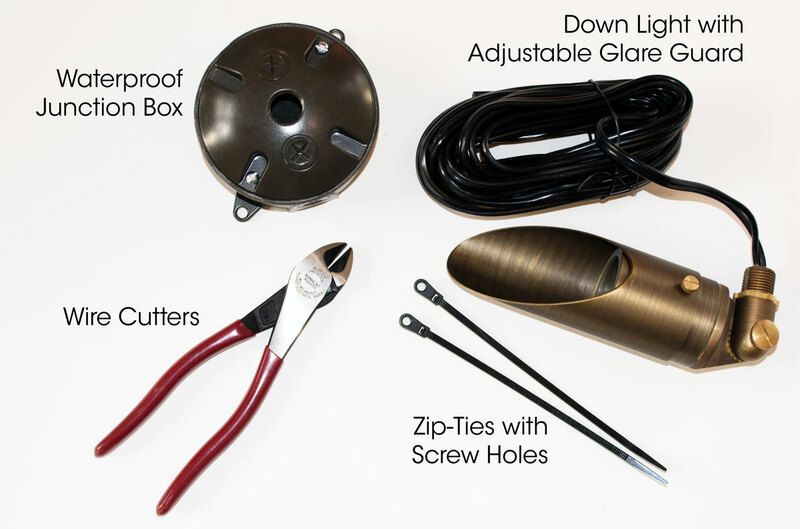 Most landscape lights have 1/2″ threads. Make sure your junction box cover does too. You will probably want to run the wire on the back side of the tree so it will not be seen from the primary viewing area. Wrap the cable ties around the wire and run it halfway around the tree. At this point you may want to move the ladder to the back side and continue attaching the wire down the tree. Attach the wire every four to five feet until you get to the ground. Down light fixture installed on tree. Click image to enlarge. Before you climb down off your ladder be sure you have your fixture aimed at your subject area. You want to make sure you’ve illuminated the area you want to showcase . Also be sure to adjust your glare guard so you don’t create glare from your viewing area or create a nuisance for your neighbors. This article has illustrated how to install down lighting or moon lighting. This is probably the most dangerous task you will be faced with as a do-it-yourselfer. If you’re not comfortable installing this type of lighting we can help.